The trade deficit narrowed from -$67.138 billion to -$65.879 billion in May as exports rose 0.4% and imports fell 0.4%. Nonetheless, for the second quarter, the Census Department International Trade in Goods report shows the balance of trade (exports minus imports) for the quarter is still negative. 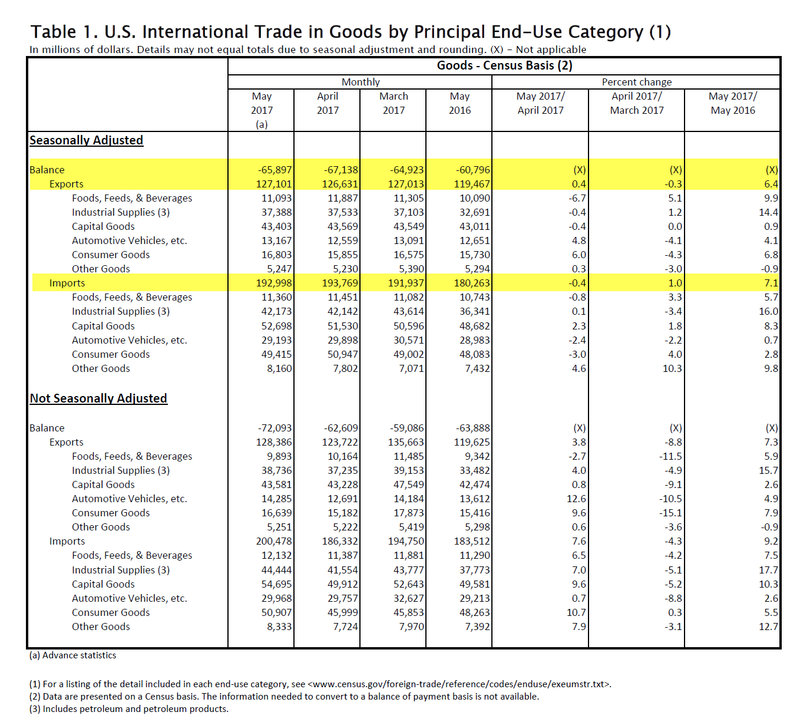 Ignoring the footnote, the second quarter balance of trade appears to be slightly negative. This will not impact GDP much. What about inventories this month? Thanks. If you look at the not seasonally adjusted number, the balance got a lot worse. What happens in May to cause such a big change in the adjustment? Retail inventories (May) with this report. would a gold back US dollar effect our trade balance? Do you think we would be able to TAKE three-quarters of a TRILLION $ worth of “stuff” from the rest of the world EVERY YEAR if we had to pay for it with Gold? How much will the inventory build this month contribute to GDP? Years ago when QE1 started to be followed by QE 2 and 3, Mish I remember early on you hammered Peter Kreeft and other economists pretty hard for saying that inflation was going to take off and you were right. Because of the sub-prime mortgage mess we discovered the banks were using leverage up to 50-60 to1 with new products such as CDS and CLO so that finally Bear Stearns derivatives blew up despite Cramers love for the company. So then we found out all the big banks and brokerage companies were also over leveraged and Paulson begged Bush and every one else for 800 billion to liquefy the banking system that was locked up with a worldwide financial panic a real possibility. Had we stopped there it still would be a dangerous situation that somebody like Paul Volcker could fix maybe with some help from guys like you and James Grant,Marc Faber and Rick Santelli instead of printing trillions of dollars and also loaning a trillion to Europe to liquefy the EU banking system. Bernanke, according to Marc Faber, did more to ruin the worlds financial system than any one person in human history! I bring all this up as extremely low interest rates and QE-1 at 600 billion( 600 billion dollars happened to be the exact estimate of how much interest American savers earned in 1 year with normal interest rates from treasury bills, notes bonds and cd’s) Bernanke was trying to inflate housing prices but later seeing stocks take off he said that stocks were his target to rescue the economy with higher stocks creating the wealth effect needed to increase demand and rescue the economy. What Bernanke started created the exact opposite- a deflationary environment (no normal interest for savers and large amounts of cheap commodities flooding into the country thus the record trade deficits) with no way out without worldwide defaults or monetizing currencies with the possibility of hyperinflation. No one knows exactly what the catalyst will be but the collapse of the over indebted world economy is coming no one can stop it!